Hacía tiempo que sentía la necesidad de tener un cuadro de Nicolás Roerich en la ikastola; en mi clase. Lo visualizaba en un lugar visible, frente a la puerta de entrada al aula; de tal forma que todos los profesores que entramos a dar clase al aula sintiéramos lo mismo que los niños: la serenidad y la armonía que desprenden sus lienzos. Y sobre todo la vibración superior que emiten, ésa que transforma todo el espacio alrededor del cuadro, tal y cómo lo he aprendido en el Centro Darjeeling. El día que me lo regaló Leo y Petri, solo pensaba en que llegara el momento de colocarlo y ver la reacción de los niños. 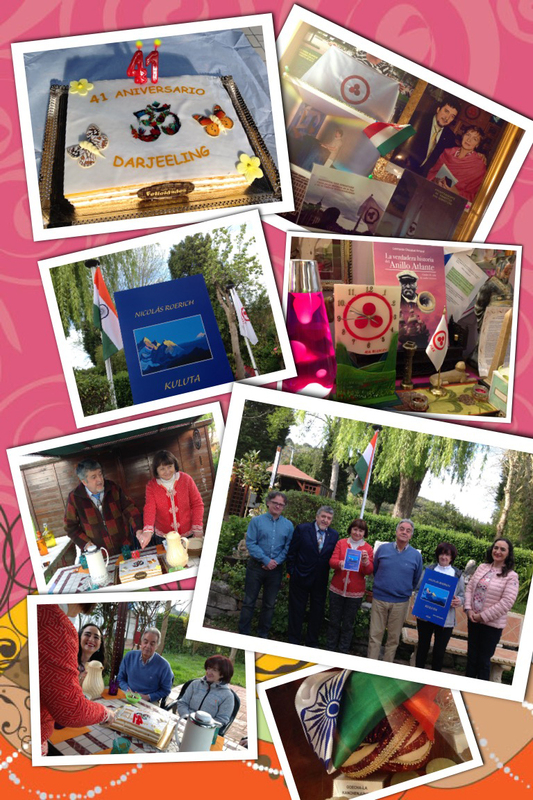 El 3 de abril, en el 41 Aniversario Darjeeling, “Vasilisa, The Beautiful” preside el aula. Después de presentarlo les dije a los niños que hicieran una descripción de lo que veían y sentían. En mi caso, experimentaba una emoción contenida de satisfacción ¿Cuál sería la respuesta de los alumnos? Yo sé que tengo una joya que da Vida. Y mis alumnos saben que es algo importante; si no, no estaría ahí expuesto. Uno de ellos lo ha relacionado con la Bandera de la Paz. Es magnífico que los jóvenes alumnos se encuentren cada mañana con la hermosa pintura del Profesor Nicolás Roerich, titulada “Hierbas beneficiosas” de Vasilisa, la Bella mujer Sabia. La historia cuenta que Vasilisa era una joven rusa muy bella y por ello la envidiaban. Cuando tenía 8 años, su mamá antes de morir, le dejo una muñeca muy especial. Cada vez que se encontrara en dificultades y le hicieran la vida imposible, solo tenía que dar de comer a la muñeca, contarle lo que le pasaba y ésta le daría los consejos necesarios para resolver el problema. También le decía las hierbas que tenía que recolectar para la salud y la belleza. Las personas de su alrededor engordaban de envidia, mientras que Vasilisa permanecía bella y jovial. Ahora bien, la muñeca le decía que tenía que trabajar mucho para compensar la Sabiduría que iba adquiriendo. Ya que -decía la muñequita- “Saber demasiado envejece antes de tiempo”. Moraleja: ¡Pon en práctica todo lo que aprendes y ten cuidado con lo que dices saber! 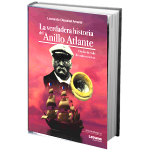 Su retiro de seis meses en la búsqueda de un tesoro literario ha dado sus frutos. El 3 de abril era la fiesta, que se celebró el domingo 7 en el Jardín Roerich con la izada de banderas, tanto de India como de la Paz. 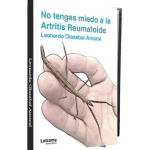 Leonardo nos presentó su nuevo libro “Péndulos Egipcios”, a falta ahora de pasarlo por las imprentas y editoriales para su edición en el próximo otoño. Se trata de una obra única en su género donde Leonardo nos habla del amuleto más fascinante y desconocido del Antiguo Egipto ¡el Tallo Verde! el cual ha hecho una réplica del original hallado en un sarcófago egipcio, y que pone a disposición de todos los seguidores del tema. Igualmente y con motivo del 84 Aniversario del Pacto Roerich, a celebrarse el 15 de abril, Leonardo, Petri y el grupo ADA, junto a la colaboración de la Sra. 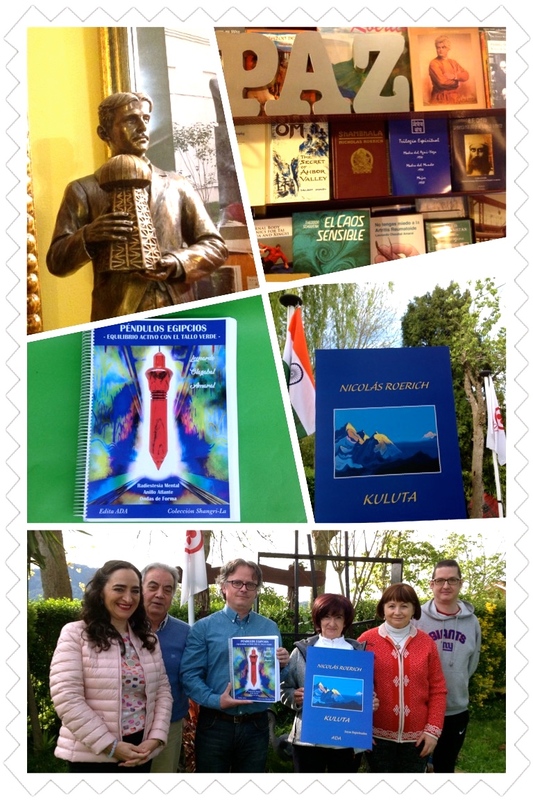 Larisa Surguina y del Sr. Ramesh Chandra, del International Roerich Memorial Trust de India, han hecho posible la edición al idioma castellano del librito “Kuluta”de Nicolás Roerich. 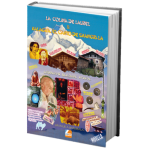 Una joya espiritual que hace referencia a los hermosos lugares donde la totalidad de la familia Roerich se instaló en el norte de India, para crear el Instituto “Urusvati” de Investigaciones Científicas del Himalaya. 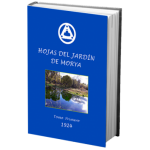 Una oportunidad -que se presenta por primera vez- para el mundo hispano parlante y así conocer algo más de la vida de los Roerich, en su hogar de Kullu. ¡Excelente trabajo al que sólo le falta la colaboración de los estudiosos de los Roerich para que lo difundan entre sus amigos! Hay que decir que los costos del mismo han sido cubiertos en su totalidad por una miembro de la Asociación ADA. 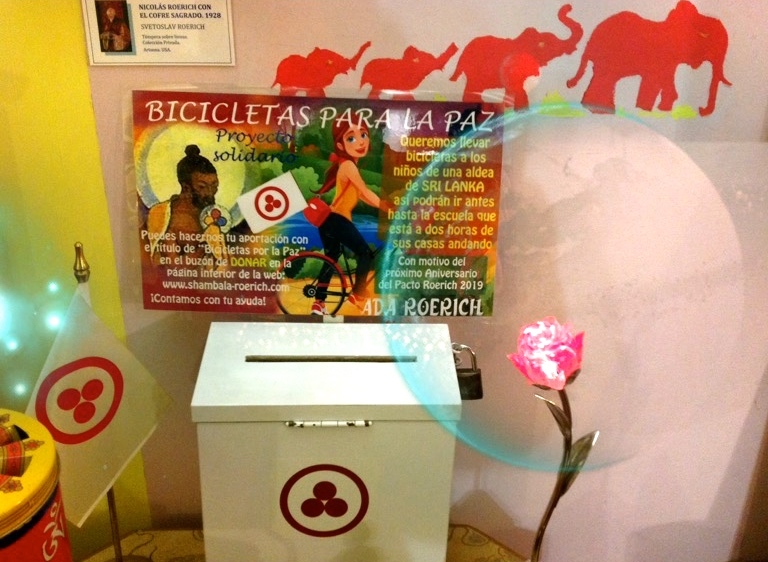 También queremos señalar que la propuesta de Leonardo y Petri de conseguir bicicletas para niñas y niños que viven en aldeas lejanas a la escuela en Sri Lanka, con motivo del 84 Aniversario del Pacto Roerich, ha sido muy loable. De 30 bicicletas se han conseguido 7 por parte de ADA y 3 por colaboraciones amigas, llegando a un total de 10 bicicletas, además de materiales escolares. Esto ha sido un trabajo visible, bello y ético, que los Roerich apreciarían como una acción práctica de sus enseñanzas. ¿Cabe mayor satisfacción? Without wanting to produce controversy and without acrimony towards anyone, the article published by Andrej Luft on his Facebook page: https://www.facebook.com/groups/roerichs.movement/permalink/2150651045195967/, about the ICR and its inevitable disappearance, due to its bad karma, it is a partial vision, like to show a table with only two legs. To say that a succession in chain of cause-effect, of action and reaction, resulted in the destruction of the Museum, is pretentious and myopic. Let us remember, in the light of the teachings, that a project of this nature has many facets in the manifestation of the Great Wheel of Life. Most of us judge the facts from the winning side, “looking after number one.” It is understandable, but we must first eliminate the animosity or enmity installed in the mind, and to see the diamond in all its facets, and not just the unpolished part. The vision of Andrej’s article ignores other facts that have supposed a great universal value and that clearly does not seem to be seen. After knowing what the ICR has been for Russia and for Europe during its 25 years of existence, we must learn to interpret and decipher its impact on Earth as an “energy model” of a Special Service, perhaps not necessarily Hierarchical at first, not well stated, but you ought to be surprised how the Spiritual Hierarchy uses “the effort of a group” when it has shown that its cultural, philosophical and scientific activity is worthwhile. 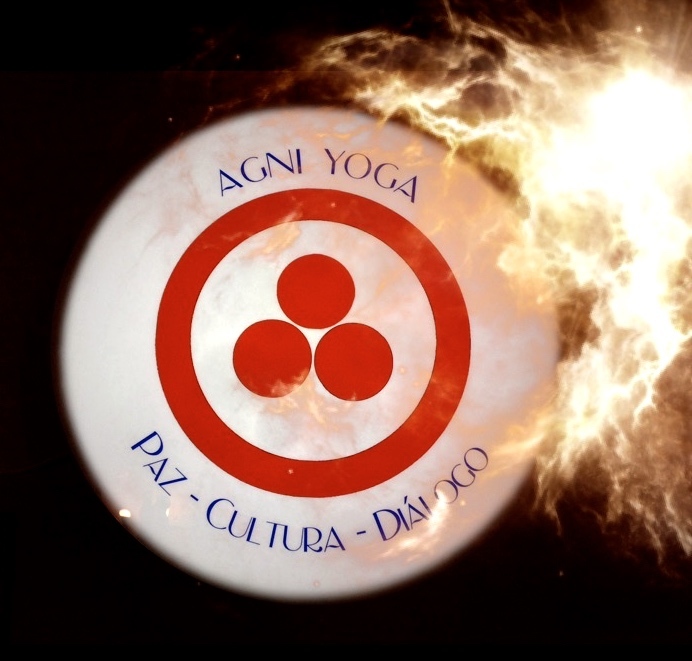 And that was the case of the ICR, a source of Light, a center of New Agni Yoga, a vehicle for the knowledge of the Peace Banner and the Roerich Pact, and above all a place from where are expanded the philosophy of Living Ethics and scientific research on the Subtle Energetics that make up the Universes. That is its energetic trace imprinted on the ethers of space. The ICR has left a potential so special that normal people can not understand it, but can intuit it. To speak about the good or bad Karma of a Museum or Cultural Organization, we must first understand that “the world manifests and does not manifest”. Everything is a mirage. And the manifestation in the phenomenal world is subject to three karmas: the good, the bad and the neutral. Like its manifestation as the 3 Gunas: Sattva (harmony, good, balance), Rajas (the change, action of tying and trapping), and Tamas (inertia, bad, imbalance). Three basic qualities of everything that exists in the Universe. Looking for one of these qualities in Andrej Luft’s article, I have seen that the old International Centre of the Roerichs in Moscow is judged by its Rajas appearance. It is about the quality of change, and about catching all that concerns the Roerich inheritance, with – apparently – an activity of unique and perhaps turbulent financing that disturbed the goal itself. Of course the ICR Museum was not sleepy, as there are other Roerich museums in the world, stiff in a past that will no longer return. The force of passion shown by Mrs. L.V. Shaposhnikova –the iron lady in the style of her compatriot Helena Petrovna Blavatsky– in her desire to tie and raise the symbol of Peace at the height of Cosmic Space, carried by cosmonauts on several occasions, as well as to the highest mountains of the planet, and to cultural and scientific institutions, even taking it to UNESCO in Geneva, Switzerland, earned many envies and conflicts. I will not penetrate the depths of the “ways” used in the organization of the ICR and its relationship with the Master Bank, but I know that when an organization or group grows too much and its “quality of work” begins to affect the social life without permission of the ruling elites and the “Ahrimanic forces”, then it is persecuted until it is destroyed. It is a “War of All against All”. So it happened with the Master Building (M.B.) – Roerich Museum from New York. Did it disappear due to its bad karma too? A Roerich project that just created itself, it is knocked down! (1929-1936). 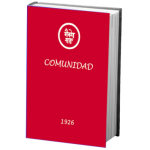 It was the year following the creation of the Roerich Pact for Peace and Culture (1935). The M.B. just lasted 7 years. At least the Russian Building (ICR) has lasted three more times. Is not this praiseworthy? And both in America and in Russia there will be nothing like them. But remember that the Gunas or forms of expression of life can not live one without another. How to proceed then? Looking for good made! Or what is the same, looking for the Guna Sattva aspect of that incredible activity that the ICR meant for the world. Now, it will see the “negative karma” of those who participated and continue to participate in the violent disintegration of such a cultural activity Roerich in Moscow. The excessive euphoria of the annihilators of the new Russian dream ICR, will suppose in the long run, an energetic descending movement that will produce darkness, disillusion and disturbance in the Roerich World and outside of it too, something that will take decades to repair it. Based on my analytical mentality, together with my experience and life lessons as a guest of the ICR since the year 2000, (with its Board of Directors and in particular with Ludmila V. Shaposhnikova and Pavel Zhuravihin), I must say with total honesty, that it has always been a cordial, transparent and honorable treatment. The respect was the main note in all my meetings with them. I will point out some significant facts in the more than 15 years of specific relationship that I have had with them, and that are totally opposed to the comments made in Andrej’s article and to all those who think like him. At least let me point out another facet of the rough diamond that was the ICR Museum, and all without preconceived ideas. Go on ahead, I do not belong to any organization. 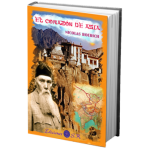 I am only the Founder and President of the Peace Banner Roerich in Spain (ADA Association). 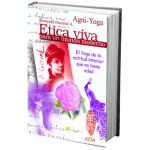 I know the life of the Roerichs and I have been publishing it since the 70s of the last century. 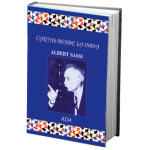 For that reason and for my publications on the subject -for 40 years- I am respected, something that perfectly understood the Board of the aforementioned International Centre of the Roerichs from Moscow. I always believed that projects such as the Master Building in New York, (which grouped more than half a dozen logos, symbols and organizations – something the ICR is accused of) or the Roerich Community from Samara in Russia, and also the “Community of Living Ethics” from Italy, among others, were and are Projects of Light, Peace and Knowledge. They are Cultural organizations and of Synthesis that have to help to settle a New Epoch and a New Order more harmonious than the present one. The dynamics of these groups, their configuration and structure – regardless of the esoteric – provide light-sound-color to space and social life with all their broad and subtle benefits. That’s why I’ve approached all of them. And I have observed and obtained a coherence and continuous flow of light that still remains with me today. 1. As Founder of the ADA Association, we were invited (my wife and me) every year to the International Conferences held at the Museum in a cultural, philosophical, artistic and scientific environment unparalleled until then. 2. At some point during the three days I was seated at the presidential table as Roerich representative of Spain, despite not understanding the Russian language (the translator did not come up here). 3. During the days that the conferences lasted, they put at my disposal a Russian-Spanish translator, who also worked as a guide inside and outside the Moscow Museum. 4. I was invited to have tea / coffee / lunch in the area (VIP) reserved for ambassadors, consuls, scientists, cultural speakers and cosmonauts among others. 5. 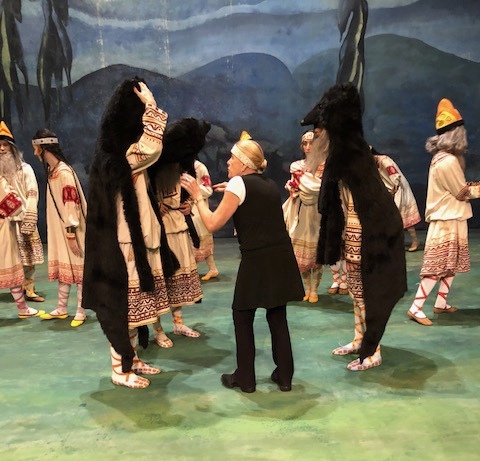 They drew attention to Ecology, denouncing the environmental abuses that occurred in regions such as Baikal Lake in Siberia, or in Altai, among others. A. Education of children in the Plastic Arts and Music. B. 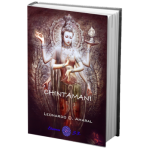 Works on Psychic Energy and Buddhist Art. 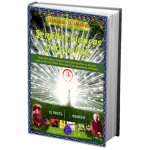 C. Editions of scientific, historical and documentary works on DVD. D. Exhibitions of children’s paintings, dances and concerts. 7. 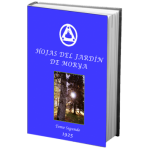 They gave me all kind of information about the works of the Roerichs and the Living Ethics, so that I could publish several books in Spain as was my wish, and all without asking anything in return. 8. In Spain there was no historical reference related to the Roerich family, except of the Basque painter Ignacio Zuloaga, who was an honorary member of the Master Building (Roerich Museum) in the city of N.Y. He obtained the Roerich Gold Medal for his exhibitions together with the works by Nicholas and Svetoslav, as we discovered in one of our investigations on the subject. I equally researched – thanks to an anonymous friend – the whole story of the Secretary Don Ramón Padilla and Satrústegui of the Embassy of Spain in Washington, USA, on the signing of the Roerich Pact in the 30s. I spoke them about these things. I also analyzed the connection of Svetoslav Roerich with the actress, astrologer and later Egyptologist, Natacha Rambova (Winifred Kimball – Hudnut). I was interested in the numerous Russian writings -on this subject and others that were not known in Europe- and the Roerich Museum in Moscow always put at my disposal the material they had on the subject, treating me always as an equal. 9. The Peace Banner Roerich was a very sensitive issue for the ICR Museum, and yet never, absolutely never, they raised objections that I handed over the Peace Banner to the institutions that I considered, but that they also participated in giving me the flags for the village of peace “Gernika” in Bizkaia, and for the city of Culture “Donosti-San Sebastián” in Gipuzkoa, both in the Basque Country (Spain), without asking for any remuneration, but always as a service to the world community. 10. Finally, I will say that I have the patented symbol (temporarily) of the Peace Banner in Spain since 2005. File No. : M-2685666. And the ICR never causes me troubles. They knew my deliveries of the Banner in India in the 90s of the last century. And thanks to this Spanish file, we got about ten centers, consulting or law firms that used the symbol in Spain, outside the Roerich centers, to withdraw this symbol before entering into trials. 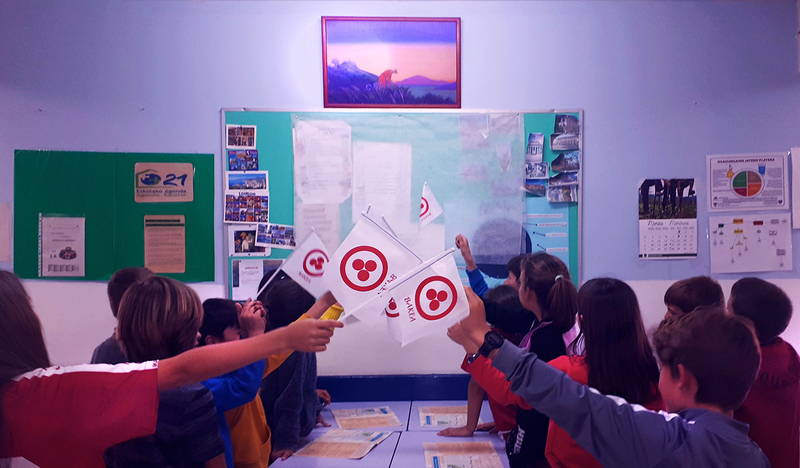 The ICR thought that the Roerich Peace Banner was a delicious sweet that was being appropriated by strange groups all over the world, and it had to be avoided; as it was shown on more than one occasion. 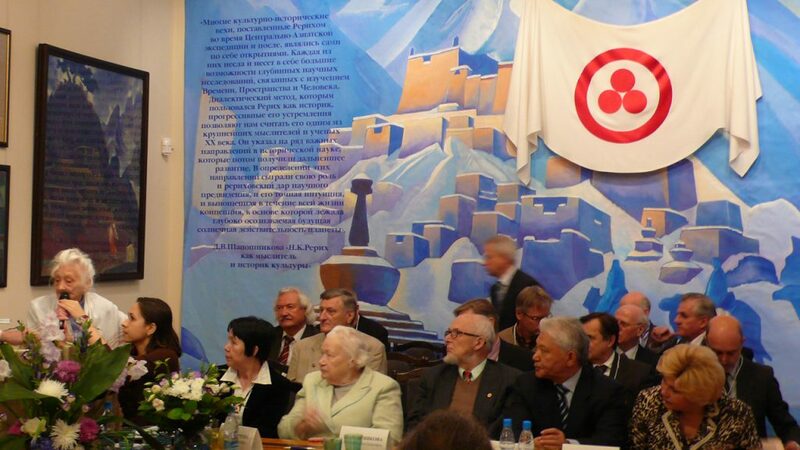 Just like the symbol of the Red Cross is respected and no one outside the organization should use it, the Roerich Peace Banner must be respected, and to avoid falling into the hands of emotional people who are not organizations or associations representative of the same, because this kind of people shows it without shame in any place or party. In addition, to patent the symbol with a file number is not to appropriate it, it is about protecting it, because the patents last a few years and then are renewed or not. They can even be changed and claimed. Una cultura de paz consiste en un conjunto de valores, actitudes y conductas, que plasman y suscitan a la vez las interacciones e intercambios sociales basados en principios de libertad, justicia, democracia, tolerancia y solidaridad; que rechazan la violencia y procuran prevenir los conflictos tratando de atacar sus causas; que solucionan los problemas mediante el diálogo y la negociación; y que no sólo garantizan a todas las personas el pleno ejercicio de sus derechos, sino que también les proporcionan los medios para participar plenamente en el desarrollo endógeno de sus sociedades. 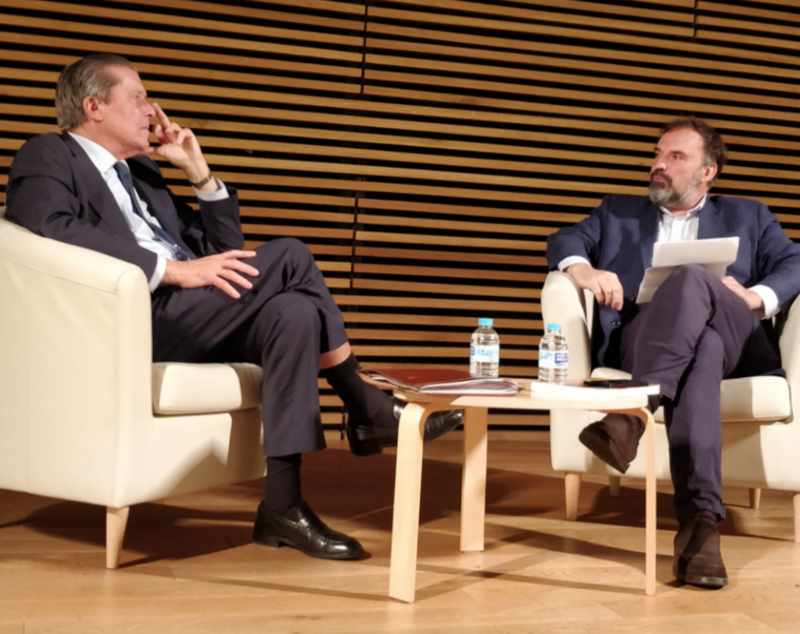 El pasado día 8 de Noviembre de 2018, en el Centro Cultural Conde Duque de Madrid y dentro del ciclo de actividades “Encuentros con lo Sutil” dirigido por el profesor Javier Esteban, el cual es un referente de la cultura alternativa madrileña desde el año 2013, se entrevistó al humanista español Federico Mayor Zaragoza. 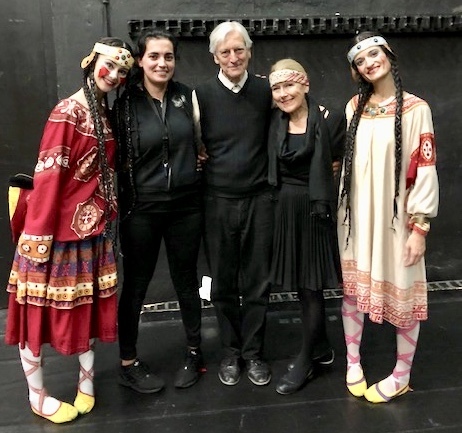 Nuestros amigos Kenneth y Millicent de Londres, han estrenado el pasado viernes 9 de noviembre una nueva puesta en escena de “ La Consagración de la Primavera” con música de Stravinsky y diseños de Nicolás Roerich, y la coreografía de Nijinsky. La producción fue con la CNB (La Compañía Nacional de Baile-Danza de Lisboa) Aquí se había puesto en escena en los años 1994, 1998 y 2006. Los bailarines de las producciones anteriores son precisamente ahora ¡maestros de ballet! Os mostramos aquí algunas de las muchas fotos que tenemos.